Why do some children succeed while others fail? The story we usually tell about childhood and success is the one about intelligence: success comes to those who score highest on tests, from preschool admissions to SATs. 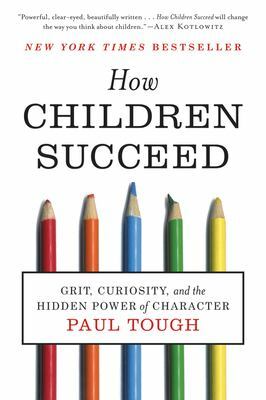 But in How Children Succeed , Paul Tough argues that the qualities that matter most have more to do with character: skills like perseverance, curiosity, conscientiousness, optimism, and self-control. How Children Succeed introduces us to a new generation of researchers and educators who, for the first time, are using the tools of science to peel back the mysteries of character. Through their stories--and the stories of the children they are trying to help--Tough traces the links between childhood stress and life success. He uncovers the surprising ways in which parents do--and do not--prepare their children for adulthood. And he provides us with new insights into how to help children growing up in poverty. Early adversity, scientists have come to understand, can not only affect the conditions of children's lives, it can alter the physical development of their brains as well. But now educators and doctors around the country are using that knowledge to develop innovative interventions that allow children to overcome the constraints of poverty. And with the help of these new strategies, as Tough's extraordinary reporting makes clear, children who grow up in the most painful circumstances can go on to achieve amazing things. This provocative and profoundly hopeful book has the potential to change how we raise our children, how we run our schools, and how we construct our social safety net. It will not only inspire and engage readers, it will also change our understanding of childhood itself. New (8658 available) BRAND NEW. Over 1.5 million happy customers. 100% money-back guarantee. Make your purchase count: support Better World Books' worldwide literacy partners.